We had a great time in Japan in April. We stayed there for 13 days, but it went just so quickly! 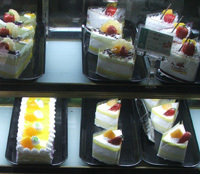 After hectic preparation, our journey to Japan went remakablly well. We had fantastic support and help from start to end. The Japan Airline airport staff were simply perfect and escorted us all the way through to the gate. Sam was so excited to see a lot of planes and a lot of people!! In the plane, again we were so fortunate to have fabulous crews. Sam had a nice, comfortable stretcher all to himself, and enjoyed the whole experience. This was not the first time for him to fly, indeed he flew to Japan twice before the accident, but he may not remember his first two flight experiences! 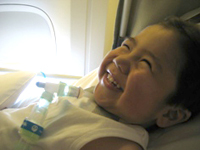 He loved looking through a tiny window, seeing clouds, blue sky, and snow covered mountains. On arrival 3 pilots came down to say hello to Sam. It was so nice of them, but he burst into crying!! He was quite tired and their uniform and hats may have been a bit intimidating for him. In Japan we visited all sort of places, museums, temples, zoo and toy shops!! We went to Tokyo Disneyland, too. There he enjoyed meeting his favorite hero, Buzz Lightyear. 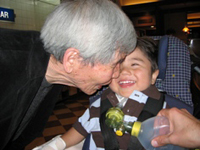 He also had a lovely time with his GIGI (Grandad in Japanese). My dad was so pleased to see him and loved speaking to him in Japanese! My dad being slightly deaf would not help their language barrier!! Sam’s Japanese was getting really better though during his stay in Japan. He defintely has much more vocabulary than his father with accurate pronouciation! It was truly fantastic experience for all of us and we cannot wait to go again!! Sam came to see us in our house during their visit to Tokyo. We had a fantastic time together! 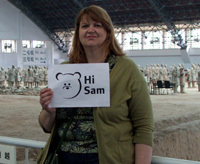 Miss you, Sam! 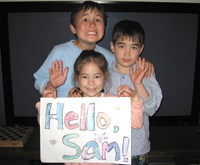 In May 2006, the first Stuff4Sam book box was started. Now, a year later we have five boxes at various offices across the country. Thanks to many donations and sales, collectively these have raised an amazing £1,750! All of which goes directly to buy equipment for Sam. Well done to all involved. 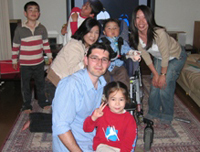 We never imagined that we could raise so much money in a simple pain-free way. Why not start your own book box – its easy! 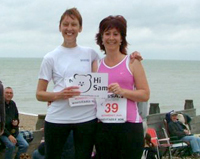 We ran the Whitstable 10k on May 7th to raise money for Stuff4Sam. 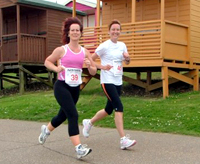 As well as sporting “Hi Sam” cards on our backs we also had signs for “Helen’s Hen Run”. Helen from our running club is getting married soon (poor thing was forced to wear a veil and tiara all the way round!). After such a lovely April we were disappointed in the weather – it was raining on and off and very very windy but our families and friends still insisted on having a beach barbie so they could cheer us on. The first 5k wasn’t too bad but as soon as we turned onto the sea front at Herne Bay we were faced with a wall of wind! It was a struggle getting back to Whitstable and there were a few times that we felt like packing it in but there were plenty of people supporting us and that gave us a great boost. Our target time was to get in under an hour – the first 5k we did in 28 mins, well on target but the wind slowed us down and we had to do a mad sprint finish to the end – almost on our knees we fell over the line in 59 mins and 54 seconds (lots of time to spare!). We then made our way back down the beach for a much needed and deserved glass of bubbly and the rain held off just long enough for us to enjoy the party. This is us after our race celebrating! During the race it rained on and off. We were glad to reach the beach at the end! I have just come back from two weeks teaching English to children who are the same age as you at a kindergarten in Xi’an. I had a good time and played lots of games with them and learnt a few words of Chinese! While I was there I went to visit the very famous Terracotta Warriors. I saw thousands of ancient statues of men and horses that have been dug up. A whole army was built and then buried to protect an emperor who is in a nearby mausoleum. It was quite a sight! Run, Fran and Ruth, run! It’s Fran and Ruth’s Whitestable 10k run this weekend. Best of luck to them. Hope the weather holds! A fundraising idea – how about giving up something and getting sponsored for it? You could do the same – no alcohol. Or smoking (the smoking ban is not long away – 1 July). Or how about giving up cakes or chocolate? It’s a great way to kick start a new regime. 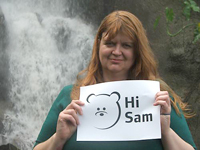 You could get sponsored by friends, family and colleagues or simply give the money you save to Sam’s fund. Go on, give it up! Here I am at the Eden Project in Cornwall. I am standing in front of a waterfall in the rainforest biome. It was very hot and there were lots of giant plants!